We are just having the best time this December. 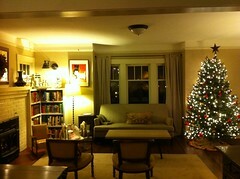 As soon as our Thanksgiving company departed Telfer put up the tree and we got our house all Christmasy. I love twinkle lights. To hear Cate say “Baby Jesus, Mary and Joseph” makes my heart so happy. We also watched the Grinch Stole Christmas last night and she loved it.